All of the variations contain a variety of ingredients mixed into the sauce base. As a general rule, the lighter the sauce, the more noticeable the flavor of the pasta will be. When selecting a sauce, consider the shape and size of the pasta noodle, since some sauces are best suited for specific types of pasta. 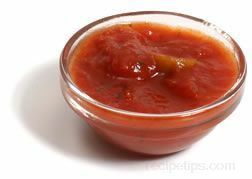 As an example, light tomato sauces go better with thinner pasta rather than shaped or tubular pasta. 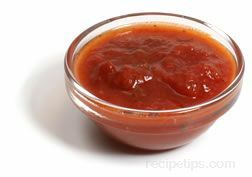 An Italian sauce, which uses traditional or country ingredients, that has a rustic style of preparation comparable to the region from which it is created. 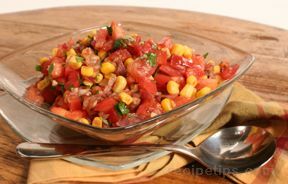 Most always prepared as tomato-based sauce, the ingredients may include tomatoes, diced vegetables, olive oil, and seasonings. 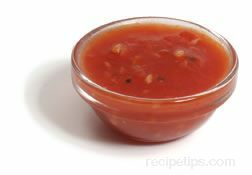 It is a sauce that is commonly served as a pasta sauce as well as a sauce for some poultry and fish dishes. Like many pasta sauces, there are several that are traditional sauces native to their region of origination, such as Bolognese, a traditional Italian sauce originating in Bologna, Italy. Most often a Bolognese sauce will contain at least two types of meat, which may include veal, beef, pork, or chicken cut into small pieces. Unlike some sauces that use ground meat, traditional Bolognese sauces start with large pieces of meat that are chopped into finely cut bits. The meats in Bolognese sauce are just some of a variety of ingredients that are used in the sauce. Among the other ingredients used are onions, celery, carrots, chili peppers, tomatoes, olive oil, and white wine, along with seasonings and herbs, such as oregano, basil, bay leaves, and nutmeg, all of which provide the distinct flavor of the sauce. 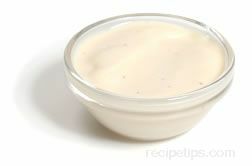 It is also common to add cream or milk to the ingredients which provides a richer flavor to the sauce. Bolognese sauce can be added to many different foods but it goes especially well with fettuccine or tagliatelle ribbon pasta, tube pastas or with lasagna and cannelloni pasta as a stuffing. A traditional Italian tomato sauce that combines crushed tomatoes, garlic and a variety of other ingredients, such as onions, basil or parsley, oregano, and olive oil into a sauce that is well seasoned. 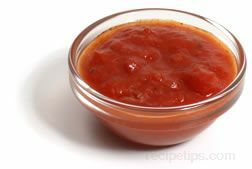 Commonly served on pasta or meats, Marinara sauce has evolved as so many other pasta sauces, into many different variations that attempt to provide an acceptable balance between mildly acidic and slightly sweet flavors. Recipes that include various forms of tomatoes, such as ground, crushed or pureed, vegetables such as carrots and chili or sweet peppers, several types of herbs or spices, and sweet ingredients such as sugar or honey are becoming more common. Originating in a region of central Italy from a town known as Amatrice located near the Adriatic Sea coast, this sauce is a type of pasta sauce known for its meaty contents. Two versions of this sauce exist, however the second sauce became known as Alla Gricia to separate the distinctive quality of each. The traditional Amarticiana Sauce typically includes tomatoes combined with pork meat sautéed in olive oil, minced onions, garlic if desired, a small amount of ground chili pepper, and a pinch of black pepper. The recipe, when made in the manner of a true Amatrice sauce, is served with cured pork meat from the cheek of the pig, which is referred to as guanciale; however, it is common to find Amatriciana Sauce prepared with the Italian bacon known as pancetta. Other types of pork are also used when the sauce is prepared in areas outside of Italy, generally because or limited access to guanciale or pancetta. Substitutes such as Canadian bacon may be used when necessary in an attempt to keep the flavor of sauce as close to the original as possible. The second sauce from Amatrice is an Alla Grica Sauce, which is considered the "white" version of Amatriciana. Both sauces are prepared in the same manner using the same ingredients except that the Alla Grica Sauce doesn't contain tomatoes; therefore, it doesn't have the dark red coloring but instead is white in color. Some of the variations of these sauces have changed over the years and may include cheese, such as Romano, as an additional ingredient to enhance the flavors. Both sauces go well as a topping for strand pasta, such as spaghetti; however, in traditional Amatrice cooking, the pastas most often used include bucatini, perciatelli, or fresh ravioli. An Italian sauce that is very spicy and strong flavored. 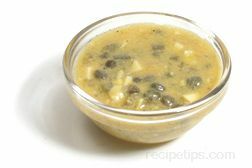 Traditionally made with garlic, bits of dried chili peppers, capers, and anchovies as key ingredients, this sauce can be mild or well seasoned depending on the type and amount of spices added. There are a variety of pasta and fish dishes using this sauce to enhance the flavor of the dish, such as Pasta Puttanesca, Spaghetti Puttanesca, Linguine Puttanesca, and Shrimp Puttanesca. 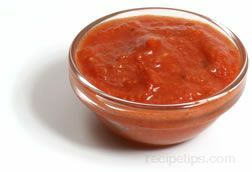 Italian in origin, this sauce is considered to be one of the fiery or spicier types of tomato sauces from Italy. Arrabbiata, which is a term generally used to describe aspects of anger or rage, is applied to the characteristics and intensity of this sauce made with chili peppers that add a spicy flavor to pasta, meats, poultry, seafood, and other foods such as pizza. Penne all'Arrabbiata (angry penne pasta) or Agnello all'Arrabbiata (angry lamb) typify dishes having a spicier taste made with Arrabbiata sauces. A traditional cheese-based sauce that is most often used as pasta sauce. The classic Formaggi sauce may be referred to as a "Quattro Formaggi" sauce, referring to the four varieties of cheese mixed in with the other ingredients in the sauce. Some of the common cheeses that are combined together and blended into the sauce include: Cheddar, Fontina, Gorgonzola, Gouda, Grana, Gruyere, Mozzarella, Parmigiano, Provolone, Ricotta, and Romano. 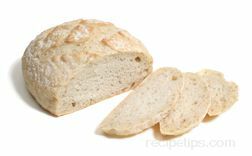 The type of pasta and the selection of other ingredients with the pasta dish generally determine the types of cheeses that will be included in the Formaggi sauce. A few of the additional ingredients that will added to the cheeses may include: cream, tomato sauce, a type of meat such as ham or bacon, herbs such as rosemary, sage, oregano, and several other mild seasonings. An Italian sauce that is usually combined with fettuccine noodles and is then referred to as Fettuccine Alfredo. The sauce consists of heavy cream or half and half that is mixed with butter, grated Parmesan cheese, pepper, and occasionally nutmeg to create a rich Italian meal. Italian pasta dishes that are served with a sauce (Carbonara sauce) made with cream, eggs, Parmesan cheese, small pieces of bacon and vegetables, such as peas. Although any type of pasta can be used, spaghetti and linguine are most suitable with this sauce. The sauce is heated for several minutes until it begins to thicken. It is then spread over pasta that is very hot, enabling the eggs to continue cooking while the food simmers. A creamy smooth textured pasta sauce that goes well with penne, ravioli, rigatonni, tortellini, or ziti pasta as well as on some poultry dishes or bruschetta appetizers. 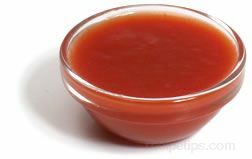 Rich in flavor, this sauce typically contains tomatoes, cream, vodka, olive oil, garlic, onions, and seasonings. Parmesan, pecorino or Romano cheese and meats such as prosciutto are also additional ingredients that may be included in some vodka sauces. A type of white pasta sauce that originated in Amatrice, Italy a small town located adjacent to the Gran Sasso massif, a mountain region in the middle of the country. Made with the distinct flavor of cured pork, the traditional Alla Grica Sauce will use cured pork sautéed in olive oil and seasoned with onions, possibly garlic, and a very small amount of ground chili pepper with a pinch of black pepper as well. When prepared as a local Amatrice sauce, the recipe will contain guanciale, which is the cheek meat of the pig. Since guanciale is not always available outside of Italy, this sauce may be prepared in other countries with pancetta, an Italian bacon, or other pork substitutes such as Canadian bacon. A second sauce from Amatrice that is considered to be the "sister" sauce to Alla Grica is Amarticiana Sauce, which is considered the "red" version of Alla Grica. 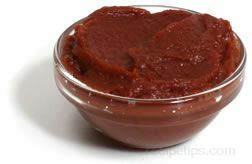 Prepared in the same manner, each sauce goes through the same preparation process; however, the Amarticiana Sauce includes tomatoes as an ingredient, which results in the deep red color of the sauce. 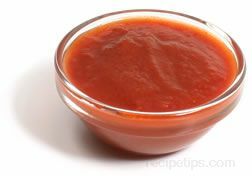 There are variations of the sauce that include other ingredients, such as cheese or garlic. Romano cheese is often used as an additional ingredient in some of the Alla Grica and Amarticiana sauces. Strand pasta such as spaghetti is the most common pasta topped with these sauces, but in Amatrice or other areas of Italy, the pasta typically served is bucatini, perciatelli, or fresh ravioli. Marsala sauce is a rich sauce made with Marsala wine as a key ingredient. 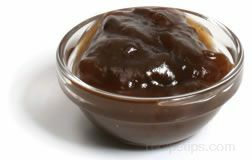 The sauce is used to enhance the flavor of pasta, poultry, pork, veal, fish, and game. 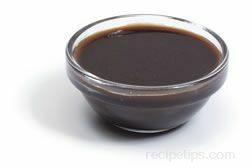 It can be made from a variety of flavored bases, such as tomato, mushroom, or fruit flavors, and it is served as a sauce for several traditional food dishes, such as pollo (chicken) marsala or veal marsala. 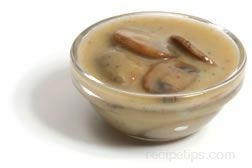 A typical recipe for the sauce may include onions, garlic, herbs, mushrooms, heavy cream, oil or butter, and the key ingredient of Marsala wine. 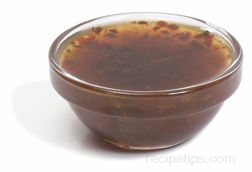 When making the sauce, the wine can be added to the other ingredients immediately or, as preferred by many, added at the end of the sauce making process. To prepare the sauce using the preferred method, the meat is first seared and cooked in a bit of oil; then it is removed from the pan. The sauce ingredients, excluding the wine (and heavy cream, if it is used), are added to the pan and are cooked with the meat juices and pan drippings for a short period. The marsala wine is added, which helps deglaze the pan and loosen any bits that have stuck to the pan. 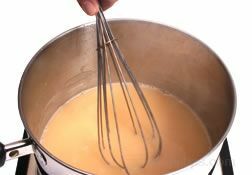 If heavy cream is to be used in the sauce recipe, it is added last. 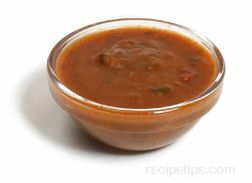 The sauce can be spooned over the meat and served immediately, or the meat can be returned to the pan to allow the sauce to enhance the flavor of the meat. A slow cooked sauce that uses the cooking process to combine all the ingredients into a blend of unique flavors. Made from ingredients that cook for 3 to 4 hours, the traditional Italian ragù included the cooking of bits of beef with chicken livers and unsmoked pancetta to be combined with tomato purée, mushrooms if desired, onions, celery, olive oil, seasonings, white wine and a stock base. 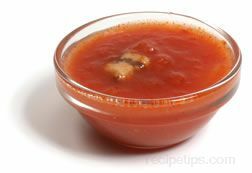 As the meat cooked with the other ingredients it began to soften and absorb all of the other flavors, turning into a fully flavored sauce providing only a mildly pronounced tomato taste. Variations of the traditional ragù sauce have evolved to include carrots, sautéed shallots, and depending on taste, either cream or milk and cheese. 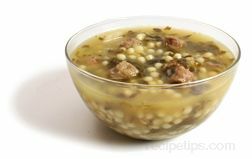 Typically the meats used in the sauce were diced, later to be minced or ground from meats such as beef, lamb, or pork, used individually or in combinations, such as beef and lamb. Made as either a tomato-based red sauce or a cheese-based white sauce, ragù is served as a base sauce for cooked pastas such as lasagna or ravioli in addition to many other pastas. 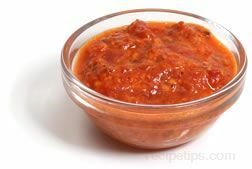 This sauce may also be referred to as Bolognese sauce, a classic ragù sauce of Bologna, Italy. Any of a variety of sauces made from fresh ingredients that have not been cooked and are ready to serve on pasta, meat, poultry, fish, and other foods. Fresca, meaning "fresh" is commonly created with uncooked ingredients that are combined to be made into salsas and pasta sauces, which are then added, either warm or cold to the foods after they have been prepared. 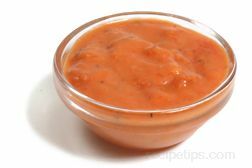 Very common in Italian and Indian dishes, this type of sauce is used as a base for cooking and flavoring dishes with poultry, vegetables, legumes, and pasta. Spinach Sauce may be made as a white creamy sauce or a red, tomato-based sauce. 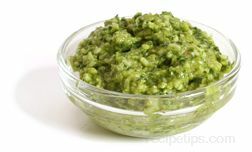 For a white Spinach Sauce, ingredients such as garlic, cheese, fresh or frozen spinach, and seasonings are often combined in a food processor to be blended, but not to the texture of a puree. 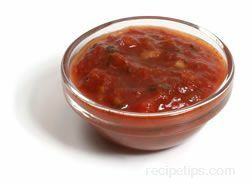 For the red sauce, ingredients are similarly processed only to a point of fine bits, which may include tomatoes and tomato paste, fresh or frozen spinach, red peppers, onions, olives, lemon juice, garlic, ginger, cumin, coriander, cinnamon, paprika, and cloves. Attributed to early Roman times, this sauce, which was more commonly referred to as Sauce Gribiche, is usually served as a condiment or dressing for salad greens, fish, poultry, and eggs. 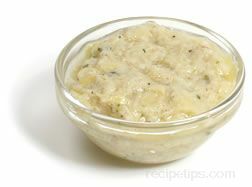 Very similar to tartar sauce, Gribiche is made with shallots, parsley, cornichons, capers, eggs, oil, vinegar, and seasonings. 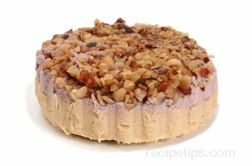 However, other ingredients are often added such as chives, other herbs, and prepared mustard. 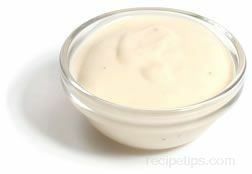 A key difference between Sauce Gribiche and tartar sauce is that the oil, vinegar, and seasonings are not emulsified (fully blended) into the Sauce Gribiche as they are in tartar sauce. An herb-based sauce originating in Italy that is typically made with basil, parsley, pine nuts, garlic, olive oil, and parmesan or Romano cheese. 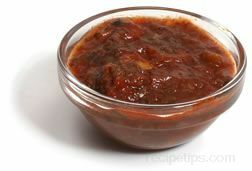 Many variations of this sauce exist, which may be different simply by the type of cheese, nuts or herbs, or other ingredients that are used to make the sauce. As an example, a red colored version of pesto, known as pesto rosso in Italian, is made with sun-dried tomatoes as one of the key ingredients, in addition to the basil, parsley, garlic, cheese and olive oil. Pesto is traditionally used as a pasta sauce but may be used as a seasoning for other foods as well as an ingredient or topping for appetizers. Fresh pesto can be kept refrigerated for 2 to 3 days or frozen to be kept for longer periods of time. As the fresh pesto is exposed to air, the outer fringes of the pesto will darken while the inner areas will tend to remain brighter in color. 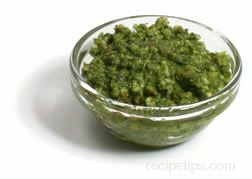 This discoloration of the sauce occurs naturally and is part of the aging process that decreases the full flavor of fresh pesto.